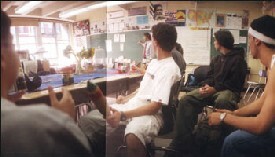 Come as you are: A classroom at the Lab School. The Lab School for Collaborative Studies aims to give students an academic program that's on a par with that of Stuyvesant or Bronx Science in a more relaxed, less competitive atmosphere. Students work hard here -- to be sure, some are as sleep-deprived as the kids at the specialized high schools  but Lab School is less intense and more intimate. "The teachers are available all the time  before school, during lunch, after school. They understand each student's problems," says Marlene Spoerri, who graduated from Lab last year. Founded in 1987, Lab combines middle and high school, serving kids in grades six to twelve. "Mixing a high school with a middle school gentles down the kids," one teacher says. "There is a toughness that is pervasive in most high schools that is missing here." Indeed, in an eleventh-grade physics class, a giant roller coaster made from K'nex, a colorful plastic construction toy, was used to study accelerated motion. Kids have built rockets and set them off in the playground. Every junior works six to ten hours a week at an internship; past internships have included positions at day-care centers, hospitals, architectural firms, and judges' offices. There is a student-exchange program in Eastern Europe sponsored by the Lauder Foundation. Co-directors Sheila Breslaw and Rob Menken admit that a small school such as theirs can't compete with the facilities and class offerings of Stuyvesant or Bronx Science. For example, Spanish is the only foreign language offered at Lab; Stuyvesant offers seven. Lab (which follows the district's arise math curriculum), offers one year of Advanced Placement calculus; Stuyvesant offers three. But, says parent Lisa Siegman, the school is "academically serious without being high-pressure," staking out a middle ground between schools with "crazy amounts of homework" and those that are touchy-feely. How hard is it to get in? Preference is given to students living in District 2. The school accepts students in sixth and ninth grades; 96 percent of the middle-school students are admitted to the high school. Lab accepts 30 to 40 new ninth-graders each year. "Kids who really, really want to come should make themselves known to their guidance counselor," says Breslaw. Downsides: One mother says there are divisions between typically middle-class Brooklynites and more moneyed Manhattanites. Cliquishness is an acknowledged problem, and the administration plans to set up a "buddy system" to pair returning students with new ones to help newcomers make friends. Guidance and college counseling: The school's college adviser, Wendy Muskat, meets with groups of parents in their homes to discuss the admissions process.